Move right into this nicely Upgraded 3 Bedroom PLUS LOFT w/ Mountain view Home located on a Cul De Sac and Boast a Large Front Yard and Nice Backyard for Entertaining! Formal Tile Entry with Step down Formal Living with Shutters and Dining Room with Vaulted Ceilings! Remodeled Kitchen with Newer Cabinets, Stainless Steel Appliances, Granite Counters, and Breakfast Counter overlooks Cozy Family Room with Brick Fireplace. Downstairs Powder Room with upgraded sink/cabinet. Individual Laundry Room located inside with direct access to 2 Car Garage! Upstairs offers a large LOFT area overlooking Dining/Living Room, Master Bedroom with wall of closets and separate dressing area with dual sinks and private water closet, shower/tub combined. Secondary Bedrooms and hall bathroom are located at opposite side of master. The whole house fan saves on A/C bills as well as all windows having been replaced. Backyard offers privacy and patio for entertaining. Large side yard can be used for dog run. Great Neighborhood with Private Pool/Spa for Homeowner's use, Park with Sport Court, Tot Lots, Picnic Areas and More! 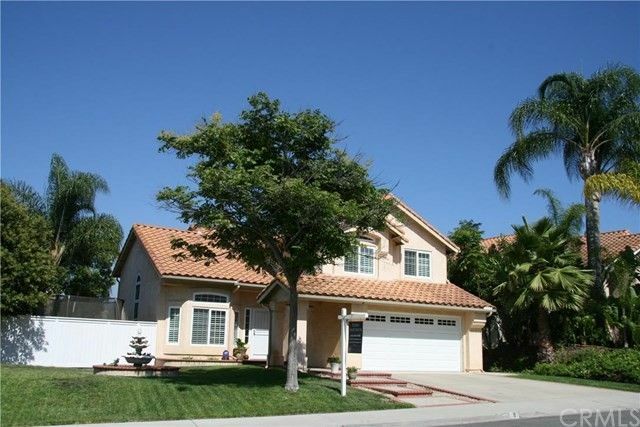 Blue-Ribbon Schools K-8, Close to fwy, toll roads, shopping and more!